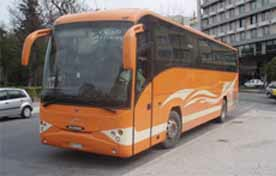 KTEL, the long-distance bus network of Greece, is a vital part of traveling in the country since the terrain and austerity cutbacks limit destinations reachable by train. With the rising price of fuel, high road tolls and gas station strikes, even car travel can be cost prohibitive or impossible at times. 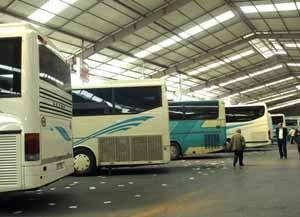 Another bonus is KTEL buses can be counted on to serve travelers when ferries, public transport and trains are on strike. Below is a list of links to local KTEL websites containing timetables and ticket fares (subject to change) for Greek buses, which was compiled after the ex-KTEL website removed all free information in March 2008 and became a paid phone service in Greek only. See “KTEL website” to learn why. *Last updated July 18, 2014. However, note that schedules can change, and answers in ‘Comments’ reflect whatever was true at that time. To pinpoint your destination without reading the entire list, use your browser. Go to the top left to “Edit” –> “Find” and start typing the city of your choice. Your browser will then highlight all matches or prompt you to hit ‘Find next.’ Try a few different spellings if you are unsure. If the two cities you need do not appear under the same heading, or there doesn’t seem to be a direct route, look at an online map of Greece and look for points in between where you could make a connection. Didn’t find it on the list? English speakers can get schedules in person or by phone at EOT offices (Tourist Information Offices in Greece; see “List of Tourist Offices in Greece“), inquire at the Information Desk at the airport or ask hotel reception upon arrival in Greece. Greek speakers can call local KTEL phone numbers in Greek. The ktelbus.com website has a contact list in English, but it only lists KTEL sites by municipality using the Greek alphabet and is not comprehensive, plus staff answering the phone will most likely only speak Greek. My list is arranged A-Z according to the English alphabet and is more complete because I include locally created, English-language sources that fill the gap where no KTEL site exists. *The link for tourist offices in Greece is correct, as provided by the official website. However, I realize it sometimes doesn’t work. That’s a taste of how your trip will go. — Luggage will be taken by the driver or you will be instructed to place it in a large compartment underneath the bus when the door opens. Passengers can bring suitcases, bicycles, boxes, furniture (within reason). I’ve never seen KTEL impose weight limits. — Overhead storage inside the bus is limited and not normally large enough for a carry-on suitcase. Most people use them for small backpacks, fanny packs, snacks/drinks, umbrellas, coats, helmets, hats, briefcase. — Look for your seat number (thesi) on the actual seat you’ll be sitting in, usually marked above or behind the seat or on the aisle in pairs. — Buses traveling a distance will make a food/smoke/rest/restroom (WC) stop midway, during which the bus is locked. There are no on-board services. — Food at Greek-owned rest stops are typically overpriced and substandard in quality, and the bus driver gets a commission — bring your own snacks/food/drink or pray for a name-brand fast food chain (rare). — Bus tickets to islands include a ferry ticket, unless you are disembarking before it crosses (i.e. Zakynthos, Kefallonia, Corfu/Kerkyra). — Be aware that many cities have two or more bus terminals. If you tell someone where you want to go, they should direct you to the correct one. — Summer schedules typically run from April-October and winter from November-March, although the transport ministry can announce differently at any time. — Tickets can be purchased online with limited (not all) KTEL websites but only in Greek. Most people show up early to get a ticket/seat and do not reserve one, although it is free. Busy routes demand you be present and buy a ticket at least a half hour before departure if you are embarking at a terminal; others allow you to buy a ticket from the driver at no extra charge, as long as there is a seat on the bus (I’ve also seen drivers take standing passengers without first informing them and getting consent that this is OK). In summer, I recommend showing up at least an hour in advance. — KTEL buses run on holidays (New Year’s, Easter, Christmas) in some areas but with a curtailed schedule; others do not. There’s no way to know in advance which will run; most people call or visit the station to inquire the day before or day of departure. Sorry, that’s how Greece is. Schedules for major routes remain relatively stable. For example, timetables posted on the website for Terminals A and B for Athens are the same now as they were three years ago. It’s predominantly (sometimes, not always) seasonal changes and strikes that prompt different schedules, and unannounced adjustments on local routes. Schedules below are in Greek and come from a different location. Click the link you need according to destination, and put into a translator if necessary. *Has Greek and English but transliterations can be confusing; I found it easier to look at the Greek version. *There is an Athens-Larissa Express bus departing 3-4 times daily, taking only 3 hours, 35 minutes. Frequent travelers can get a Loyalty Card that entitles them to one free ride for every five paid rides. Use the Destinations Map under ‘Bus Information,’ and click destination for schedule, ticket prices and travel time. Easily the best KTEL website in existence. All local routes were suspended indefinitely as of November 26, due to unpaid debts of 820,000 euros by vendors and the government, but restarted November 29 thanks to creditors. Click your selection, then scroll down the left menu and choose your route. * More websites will be added if they come available. Valid additions and corrections are welcome, as always. We need to reach Parga from Thessaloniki. Is there a direct bus in July and when does it leave. If no direct connection, how can we reach Parga from Thessaloniki by bus? Thank you very much! I found the answer to your question by following the instructions I give under ‘Tip.” Use the browser, go to ‘Edit’–> ‘Find’ then enter ‘Parga.’ Under KTEL Thesprotia, Thessaloniki and Parga are both listed. The website is in Greek, but you can copy the link I gave and put it into Google Translate to see it in another language. Look at schedules: 1) Thessaloniki –> Igoumenitsa and 2) Igoumenitsa –> Parga. All best. Hey, Kat! Thanks a ton for putting up all this information on your website. I just returned from a trip to Greece, and I found this site very helpful in planning my itinerary in the initial stages. Hei everyone! I need KTEL bus timetable from Igoumenitsa to Lefkas (via Preveza) but I can’t find any. Can you please help? It will be on Sunday morning, July 18. Thanks! I found the answer to your question by following the instructions I give under ‘Tip.’ Use your browser, go to ‘Edit’ then ‘Find’ and type in ‘Lefkas.’ By doing that, it highlights KTEL Lefkada on the list, and Igoumenitsa, Lefkas and Preveza are all listed. Click the link to see schedules. I also gave this answer on July 16, 2008 in Comments, in response to ‘Mara’ who asked the same question. First, I want to thank you for all the valuable inside information you provide – it is much appreciated. I have been doing a bunch of online research about how to get from the Tripoli or Sparta area to Kylini so that I can take the ferry to Zakynthos, but I can’t find clear information. I will be visiting family in either Sparta or Tripoli and am scheduled to head to Zakynthos on August 21st (a Saturday). Can you recommend the fastest/easiest way to get there by bus? It seems like I may be able to get a bus to Pyrgos, but I can’t find info on how to get from Pyrgos to Kylini. Any advice would be greatly appreciated. This highlights KTEL Ilia on the list, and Kyllini is also in the same group. The website is only in Greek, but I believe you can read Greek. For those who cannot, this is the direct link to KTEL schedules for “Pyrgos-Kyllini and Kyllini-Pyrgos“; copy/put the link into Google, babelfish or another translation program. The Tripoli-Pyrgos schedule is under KTEL Arkadia. Thanks for stopping by and have a nice trip. I’m confused, the terminal B site above says the bus to Volos leaves at 10:30 am but the Magnisia site if you look at return(meaning when it leaves from Athens) it says 11am. Which one is correct? From my experience I’d say 11at least it was last yr but not 100% sure. Also, instead of getting there early are you saying that I can call up and reserve a seat? This is Greece. Unfortunately, schedules can be inconsistent and change seasonally, daily or for other reasons. Yes, I’m saying you can call and reserve a seat by giving your name. Most don’t allow you to pick a seat, however. Yes. You should have found the answer by using the search advice I give under “Tip,” which shows you the Rhodes schedule/link on the list. The Rhodes Town – Lindos bus picks up passengers in Faliraki. Thanks for gathering all this information in one website! Your website should be on Lonely Planet. Could you please advise me on the best route from Lefkada/Preveza to Delphi. I realized there is no direct bus and I will have to make connections. Where is I better for me to connect Amfissa, Itea? Stats show that people recommend this post in the Lonely Planet, Frommer’s, Fodor’s and TripAdvisor forums; thank you for saying so. My suggestion is to take Lefkada/Preveza to Nafpaktos (schedule under KTEL Etoloakarnanias) and Nafpaktos to Delphi (schedule under KTEL Fokida). It’s the most straightforward route I can see, plus Nafpaktos is a nice place to visit should you not want to make the trip in one day. All best. Does the bus from Athens to Delphi run on Christmas Day? If so, is it the same schedule as stated under the Terminal B link? please can anyone advise can get a bus from Zakynthos airport to Zakynthos town am arriving 12.55 this Tuesday. If you do a Google search on ‘Zakynthos airport,’ it tells you that it’s in Laganas. In the article above, there’s a KTEL Zakynthos ‘Local Routes’ link. Click it and find the schedule for Laganas to Zakynthos. Can you help me with what train or bus i should catch to go athens to kalampaka (meteora) and then from Kalampaka to Pyrgos?? Athens to Meteora. This question has been answered several times already. Follow the advice under ‘Tip,’ using your browser. Go to ‘Edit’ then ‘Find,’ type ‘meteora’ and the first highlighted entry takes you to KTEL Athens. Click the schedule. Kalambaka/Meteora to Pyrgos. Follow Kalambaka/Meteora –> Trikala –> Pyrgos. Using the advice I give under ‘Tip,’ you could have found the schedules for those two legs under KTEL Trikala and KTEL Corinth. At the end of July 2011 we will be attending a wedding on Corfu. From there we want to see relatives in Kastoria and then go to Athens. Are there buses from Igoumenitsa to Kastoria and then Kastoria to Athens? How can I find the schedule and the rates? Just so you know, you could have found the answer to your question by following the instructions I give under “Tip.” That’s what I did. Use your browser, click ‘Edit’ then ‘Find’ and type Kastoria, it will highlight Kastoria-Athens as the first entry under KTEL Athens. Click the link, look at the schedule. If you click ‘Next,’ you’ll find Kastoria and Igoumenitsa both listed until KTEL Macedonia. Click the link, read the schedule. There’s no way to predict what bus fares will be in July 2011, as we are living in times of austerity. Rates are due to go up, and we just had a third tax increase take effect January 1.
b) Show that YOU are willing to exchange links: Your website doesn’t include me under ‘Links,’ why should I link to you? c) Don’t reuse photos without permission or credit: The first thing I saw upon visiting your website was a photo you took from me. Not a good first impression. At this time, I regret that I deleted your link and cannot add you. All best.